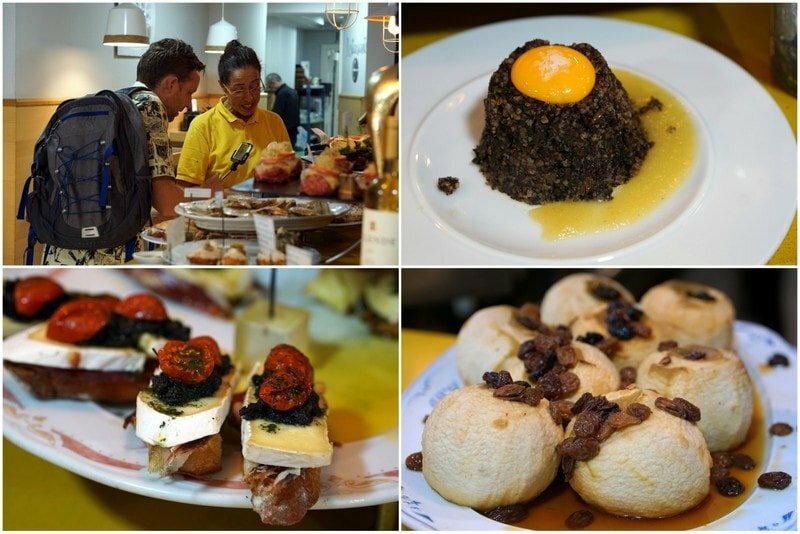 Join me for an afternoon search for the best pintxos bars in Gros! A young and ever-evolving neighborhood near Zurriola beach, Gros is known as one of the best places to eat in San Sebastian– especially for pintxos. In contrast to the bustling old town, Gros is clearly more residential, and therefore much less crowded. 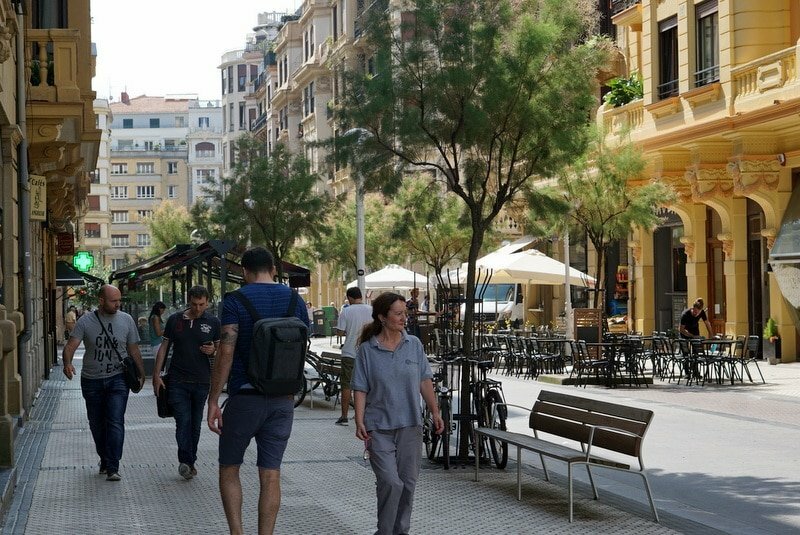 The big boulevards give you plenty of space to walk from pintxos bar to pintxos bar, in search of the perfect bite. The humble Gilda, one of the best pintxos in Gros! Developed in the 1800s as an extension of the old city, Gros is now becoming known for being more modern and trendy. It’s here you’ll find brunch restaurants and hipster coffee shops. But while it’s certainly embracing the new, there are plenty of classic and traditional pintxos bars in Gros as well. The area is filled with places that are over 50 years old and have true local charm. I explored this neighborhood with my colleague James, co-owner of the Devour Tours, and the host of Spain Revealed, a YouTube channel that gives his take on all things Spain. We set out to make a video about the 10 best pintxos bars in Gros— although eight bars in we had to call it a day! Over the course of three hours, we visited eight wonderful places and tried over 15 different pintxos. In comparison to the elaborate pintxos of the old town, the pintxos in Gros were a bit more down to earth (we didn’t see any smoke or spheres!) but I actually preferred this, as the quality was excellent and the local vibe was great! If you want to get off the beaten path and venture into a neighborhood, Gros is a great option for a pintxos stroll. Here’s what to look for when you visit Gros. 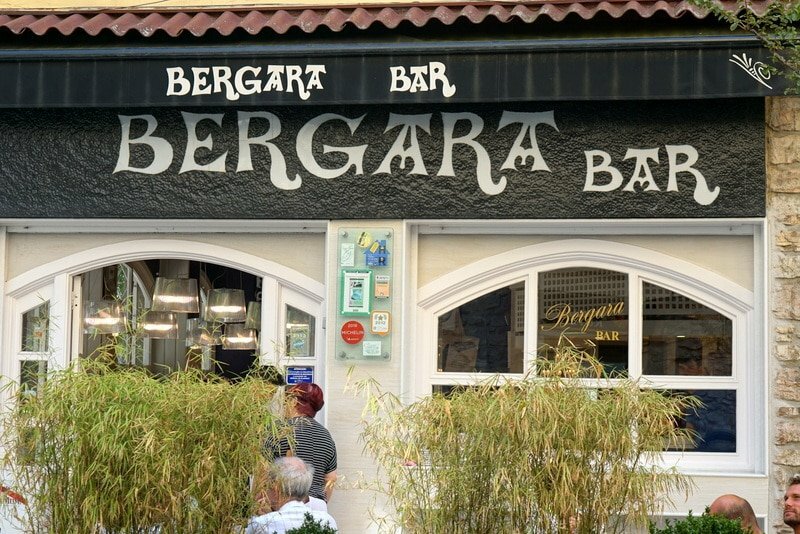 Start at Bar Bergara, a Gros pintxos bar founded in the 1950’s that many locals consider the best in town. It’s currently run by the friendly Monti, a third-generation restauranteur. 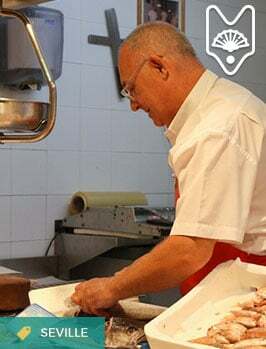 It was his parents who changed the bar’s concept in the 1980’s, from doing classic “menus of the day” (fixed price lunch menus) to the pintxos concept so loved today. Monti pours us some cider. 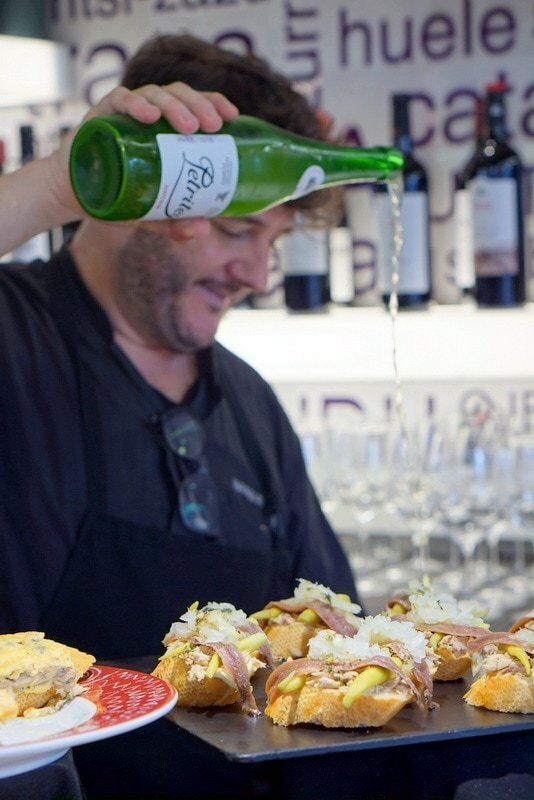 What to order: Try the txulapa pintxo (named after traditional Basque boats), which is a crunchy piece of puff pastry filled with mushrooms, cava, and cream and then topped with cheese and cooked in the oven until hot and melted. Another favorite is the classic combination of salt-cured and vinegar cured anchovies on bread, called a matrimonio in Spanish (marriage) and bikote at Bar Bergara. A bit austere looking, I knew the no-frills Bar Ricardo would be a great local place! It was filled with boating memorabilia and groups of men drinking cider, and a big sign warning that credit cards are not accepted. The young man behind the bar had no idea how long it had been open– but his uncle told me “forever”. 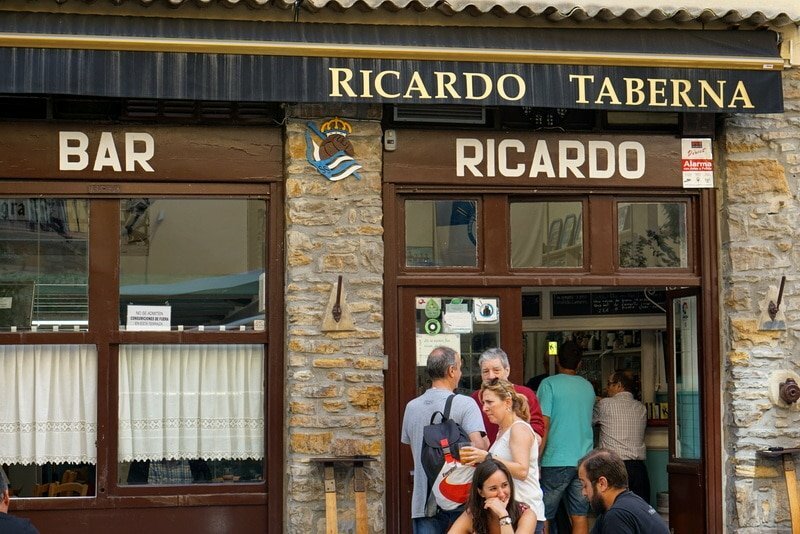 Their family had taken over in 1974, but like many bars in Spain, the original story of Ricardo had been lost over the years! What to order: Our friends had told us we had to try their famous mussel croquettes (croquetas de mejillones). We ordered one to share (they’re huge!) and a little bit of cider to go wash it down. The croquette was creamy, delicious, and filled with mussel flavor. The family who owns this famous hole-in-the-wall opened at this location in 1996 but had run other pintxos bars previously. They have always specialized in simple and traditional pintxos: mussels, chorizo, boiled shrimp, and their homemade tortilla. But in 2012 a famous French food writer put their tortilla on the map in an article, and since then they’ve won awards for the best tortilla in town. The perfect spread – a classic pintxos bar is my favorite! Their famous tortilla — definitely one of the best I’ve had! What to order: A pintxo de tortilla of course! Perfectly cooked with bits of onion and bell pepper, they sell over 100 a day for good reason. 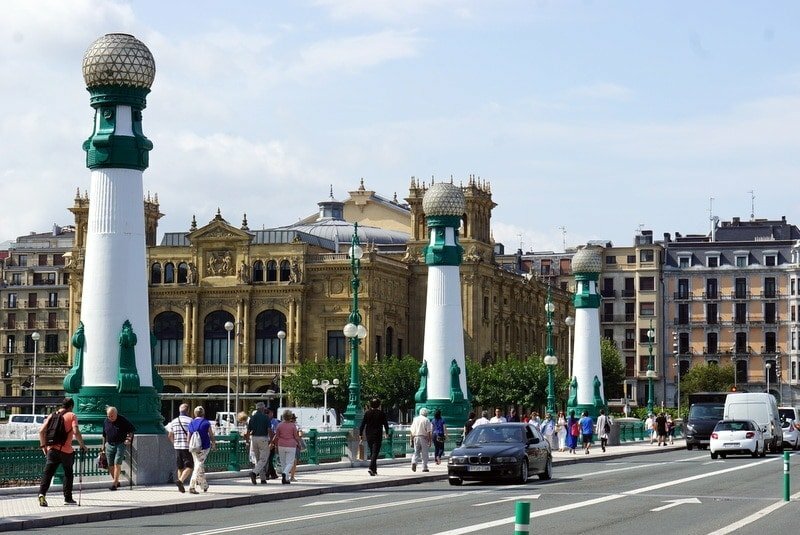 Visiting San Sebastian? 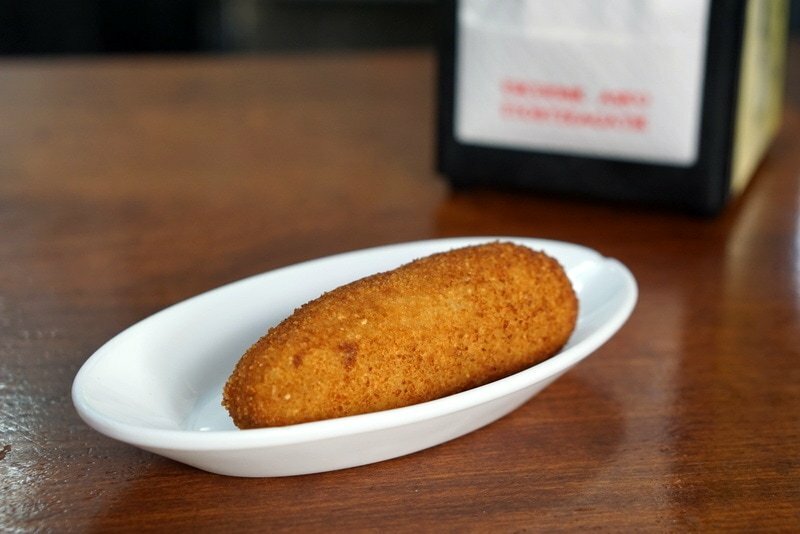 Don’t risk bad pintxos! Discover the art of the pintxos crawl and learn all about San Sebastian’s unique culture and history on my company’s Devour San Sebastian Pintxos and Wine Tour (the tour takes place in the old town, so the next day use this Gros guide for an awesome pintxos lunch on your own!). For something different, we broke with the traditional and headed over to Matalauva, a new pintxos bar in Gros that’s less than two years old. Their claim to fame? They have no kitchen! Since the space has no cooking exhaust, they must prepare everything in special slow cookers. 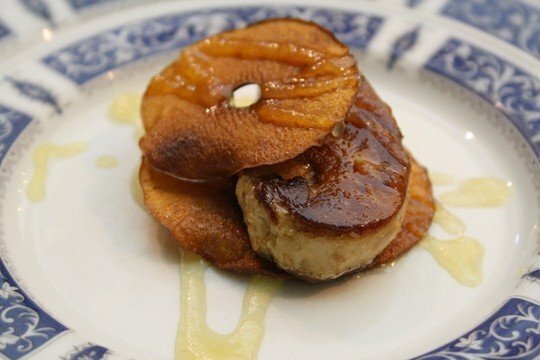 They give traditional dishes a slightly modern twist, inspired by their unique situation. Kokotxas in garlic soup and bread stick with Iberian pork fat. 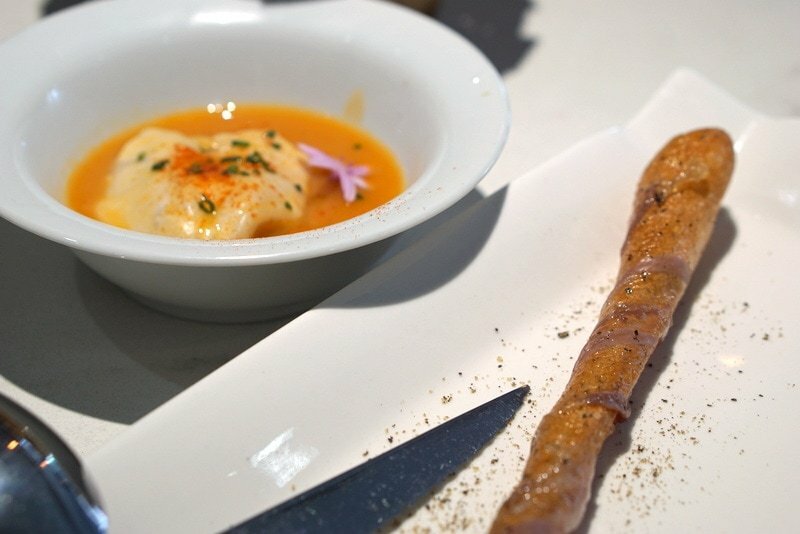 What to order: Their flauta de jamón is an airy breadstick wrapped in the fatty best part of the Iberian ham, and their kokotxas de bacalao are incredible — codfish neck glands in a garlic and tomato soup. 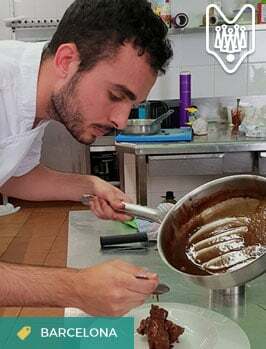 Next on the list of best pintxos bars in Gros was a little hole-in-the-wall that had been recommended by multiple friends, and our super foodie Devour San Sebastian City Coordinator, Ania. We walked in and met Nubia, the owner, whose father-in-law had started the bar in 1956. 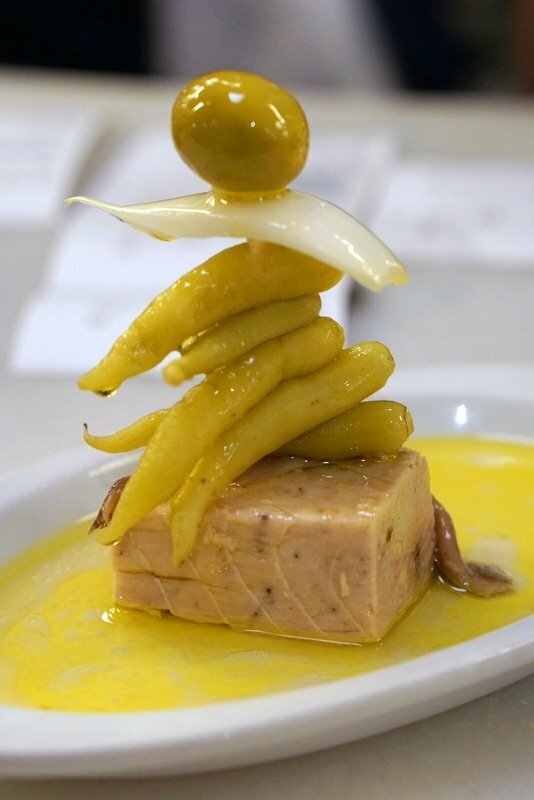 Her take today is classic Basque pintxos with gorgeous presentation and a killer wine list. My kind of place! James films Nubia and her pintxos at Hidalgo 56. Everything looked delicious! What to order: Everything here looked amazing, but we were hitting a wall! We chose to try one of their house specialties, the volcán de morcilla— a blood sausage volcano topped with an egg yolk. While a bit scary sounding for some, I guarantee it’s delicious and worth a try! Getting closer to the end of our crawl, we entered into the heaving Bodega Donostiarra and inched our way to a spot at the crowded bar. This was clearly a place the locals loved. Opened in 1928, the bar specializes in excellent traditional dishes. Everything looked so incredible we made plans to return for lunch the next day! What to order: You really can’t go wrong here, but we had the Indurain pintxo (gorgeous local bonito tuna with piparra peppers, olives, onion, and extra virgin olive oil), and the tomato salad. We were struggling by the time we arrived to Ramuntxo Berri, but had been told that we couldn’t miss it’s star pintxo. 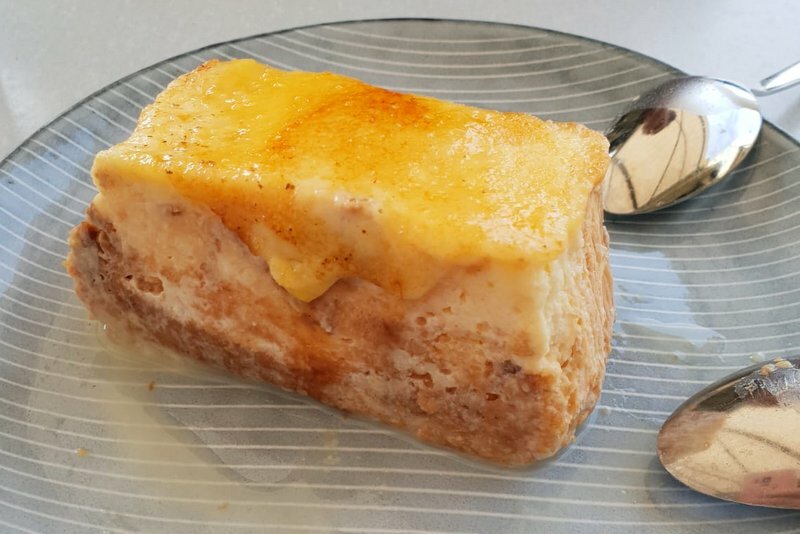 We ordered a glass of Rioja Crianza and made room for one last bite– before dessert that is! 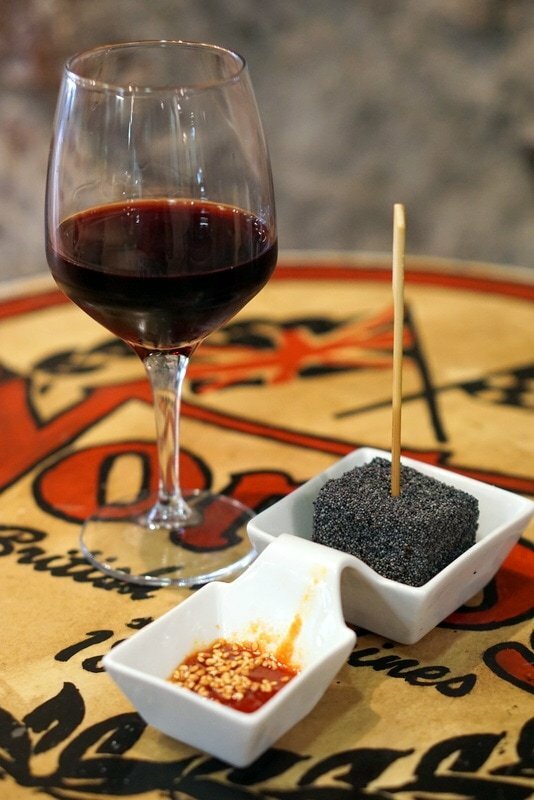 The curious mix of brie, poppy seeds, and tomato jam– with Rioja of course! What to order: It may look a bit odd, but try the Brie cheese covered in poppy seeds. The melted Brie is delicious and the crunchy poppy seeds make it seem fried — even though it’s not! 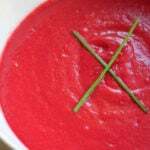 You dip it in sweet tomato jam. It’s the perfect pre-dessert pintxo! Bordering the seaside, Ni Neu specializes in modern cuisine. They have plenty of pintxos, but also a full restaurant. However, we were there for one thing only — their famous torrija! What to order: Try their torrija, a delicious piece of brioche that’s soaked in milk and sugar and then fried and caramelized. 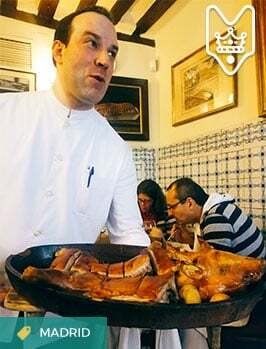 Gros is definitely a fantastic place to go if you are a food lover visiting San Sebastian. While the old town has tons of amazing pintxos bars, you’ll find excellent quality in Gros and a more local feel. 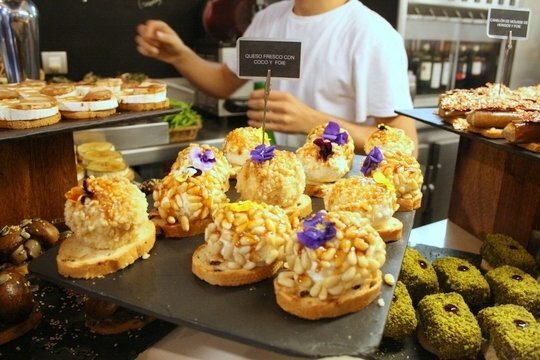 Follow this list to do what we did and try eight of the best pintxos bars in Gros– remember to not get distracted by all the pretty pintxos on the bars and fill up too fast! 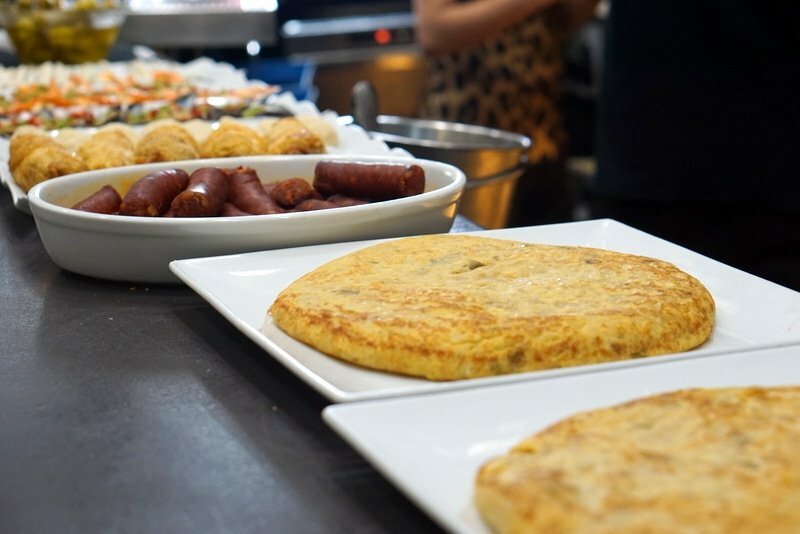 Read more: See my full food guide to eating in San Sebastian! In Gros for a sit down meal? Check out this list of great restaurants in Gros. 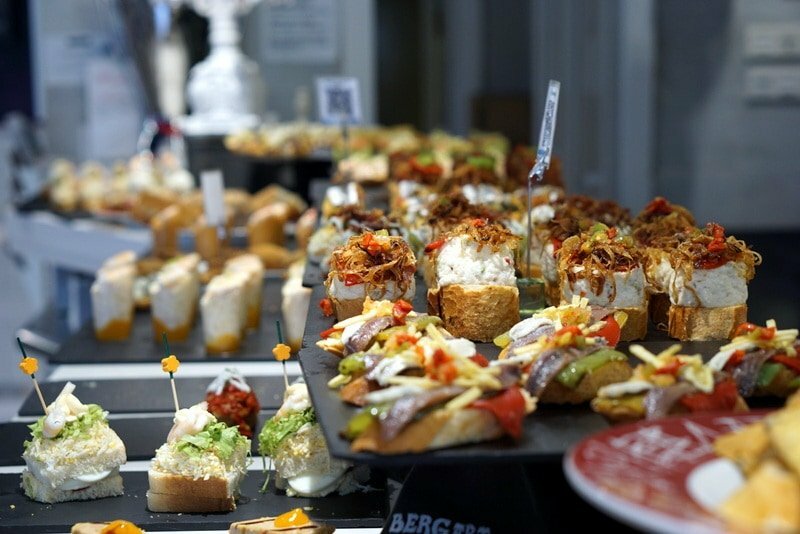 What’s your favorite pintxos bar in San Sebastian? Leave me a comment! thank you for this , Lauren ! Very useful for our annual ferry to Santander > along the coast to France then over to the Lot ! All of these photos are making me so hungry!! So many great places to try the next time I visit Spain. 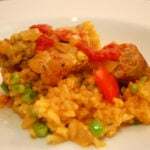 I like so much your article, because I’m looking for a goods places for taste good “Tapas”. 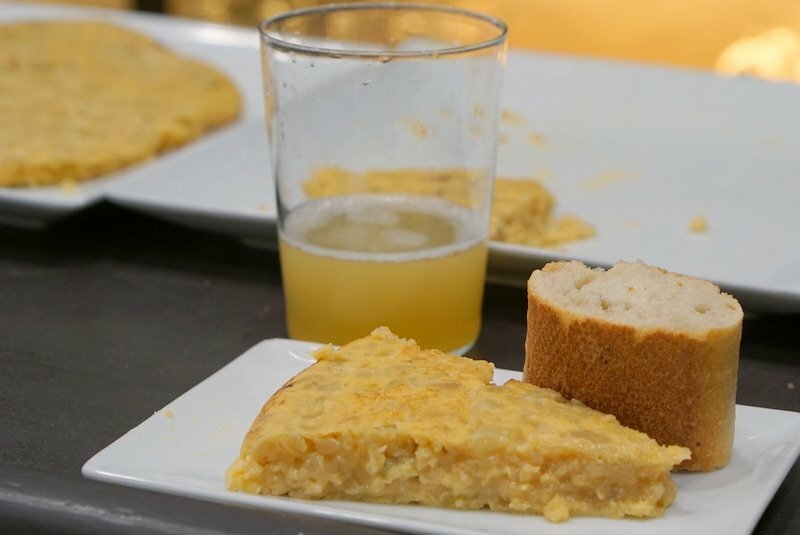 I came across your post when I was googling tortilla in San Seb. I stayed there for a month across Bar Zabaleta and used to eat there every morning. My friend who was looking for a Michelin stage ended up working there and learning how to make the tortilla. I need to call him for the lesson. The owners are lovely. On 3 Kings they even gave me a gift. Aw that is awesome! So sweet.